Roemex provides a full range of products for hydrotesting, mothballing and dewatering operations with a particular focus on achieving environmentally friendly CEFAS ratings (GOLD rated with no substitution warnings). The development of stick versions of these chemicals was done to aid deployment. These sticks would generally be deployed by ROV's or divers with wrapping on the sticks to delay chemical release until the sticks are in place. This delay time can be adjusted to suit customers needs. Hydrotest sticks require some liquid movement to allow them to disperse so should not be used in totally static situations. It is also possible for us to offer pre-treated liquids. For example, we can treat deionised water or MEG:Water blends with Hydrotest chemicals (for example with oxygen scavenger, biocide and corrosion inhibitor); this is particularly useful where pumping facilities are limited. RX-9022 is our most commonly used leak detection dye due to its excellent environmental profile and high visibility. Clear Pipedye offers advantage over more familiar leak test tracers in being invisible to the naked eye, i.e. non-fluorescent under received white light whilst being very strongly fluorescent under tuned UV light. Therefore, the obvious visible presence of discharged test solutions either at sea or in tidal waters is avoided. RX-9026E is not visible with the naked eye; special detection equipment is required. Roemex representatives can advise on this. Highly visible, fluorescein dye produces a strong yellow / green colour once diluted and is normally identified by UV fluorescence at a wavelength of 491 nm, making it an exceptional tracer dye for use in hydrotest leak testing operations. Normal dose for application is in the range 25 – 30 ppm. Roemex cannot stipulate an exact dose for RX-9025. This is due to the strength of colour required being determined by a number of scenarios e.g. style and sensitivity of detection apparatus, sea bed depth and tidal currents. Generally, as a rule of thumb, the dye must not be dosed below 25 ppm. Removal of oxygen from pipe work during the installation stage is important because this is a mechanism for corrosion in pipes. Oxygen scavenging rate is dependent on the temperature of the liquid and also the dose of scavenger used and the initial oxygen content. The oxygen content of cold water is higher that the oxygen content of warm water meaning that higher doses of oxygen scavenger are required to achieve rapid deoxygenation subsea. Roemex use Hach Orbisphere electrochemical sensors in the laboratory which enable screening and performance testing of hydrotest chemicals and oxygen scavengers for efficiency in a variety of water types. This technique can be coupled with LPR tests and pH in one cell so that all 3 parameters can be measured at the same time. For Hydrotest applications, Roemex is able to supply most commonly used biocides on request. Our most frequently used biocide is RX-270 which is effective against a wide range of micro-organisms commonly found in oil and water systems, including sulfate-reducing bacteria (SRB) and acid-producing bacteria (APGHB / APB). RX-270 will not cause foaming in water or oil systems. The treatment rate for RX-270 is dependent upon the nature and level of bacteria present. In general, for batch treatments a typical dose rate of 500 - 1,000 ppm would be expected. At these dose rates RX-270 will control the growth and proliferation of bacteria present in the system. RX-270 can also be used for hydrotest situations. The necessary dose rate is dependent upon the length of time protection is required for. If solid biocide is required, RX-1228 can be used. RX-1228 is a granular biocide which can be supplied in a number of different guises for pipeline hydrotest applications. RX-1228 can be supplied in water soluble tubing or film in a number of different sizes to fit with the application. RX-1228 is also available in a liquid form– RX-1237. For hydrotest applications with sea-water, typical doses are 200 ppm RX-1228 for 0 to 12 months protection and 400ppm RX-1228 for 12 to 24 months protection. In cases where large numbers of yeasts and moulds may be likely a much higher dose of RX-1228 will be required. We are also in the process of developing new liquid and solid corrosion inhibitors for the Hydrotest product range with improved environmental characteristics. Linear Polarisation Resistance (LPR) is a commonly used technique carried out as a rapid screening technique on a large number of inhibitors before submitting for further test work. There is capability for conducting tests under sweet or sour conditions and at temperatures up to 95°C. Partitioning evaluations can also be carried out using the LPR equipment. It is important to evaluate the long term performance of corrosion inhibitors intended for long term protection. In order to do this we carry out static coupon tests using commonly found metals. The coupons are immersed in seawater or potable water containing the hydrotest chemicals being tested. They are then given a nitrogen blanket, stored at 4°C and are monitored for up to 5 years. Roemex use Hach Orbisphere electrochemical sensors which enable screening and performance testing of hydrotest chemicals and oxygen scavengers for efficiency in a variety of water types. This technique can be coupled with LPR tests and pH in one cell so that all 3 parameters can be measured at the same time. Due to pumping and deckspace constraints, it is often costly to inject separate oxygen scavengers, biocides and corrosion inhibitors. For this reason, Roemex has developed a number of combined products. RX-5254 is a combined 3 in 1 liquid containing biocide, oxygen scavenger and corrosion inhibitor with outstanding technical, commercial and environmental profiles. Outstanding environmental profile; CEFAS Gold, No Substitution Warning. NEMS Yellow Y1. Dose optimised to 450ppm providing a minimum of 2 year protection time. Optimised manufacture process means vastly improved lead times, especially for larger volumes. RX-5255 is a 4 in 1 liquid hydrotest cocktail comprising corrosion inhibitor, biocide, oxygen scavenger and leak detection dye. It is designed to provide effective corrosion mitigation and leak detection whilst maintaining the highest environmental credentials, OCNS Gold, no substitution warning. Designed for compatibility with seawater, potable water and MEG. Stability, compatibility and independent performance data can be supplied upon request. RX-5208 is a combined Oxygen Scavenger and Biocide which is made up from 33% powdered oxygen scavenger and 67% powdered biocide which can be supplied in a number of different guises for pipeline hydrotest applications. RX-5208 has been specially designed to allow the oxygen scavenger to be released into the seawater before the biocide. This allows the seawater to be deoxygenated prior to release of the biocide. This way there is no adverse interaction / inhibition between chemicals. RX-5208 treatment rate is based on 20 ppm of oxygen scavenger : 1 ppm dissolved oxygen. Standard RX-5208 stick is 150g with dimensions 260 x 34mm. RX-5722 is a combined Oxygen Scavenger and Corrosion Inhibitor. RX-5722 is typically supplied in 34mm diameter water soluble tubing. The oxygen scavenger in RX-5722 removes dissolved oxygen from seawater on contact. The corrosion inhibitor in RX-5722 is a solid fatty amine based Corrosion Inhibitor. Quaternary ammonium compounds are good film forming corrosion inhibitors; which means the residual will form an amine film on exposed metal surfaces, thus providing a good excess residual inhibition in the system. RX-5722 has been specifically designed for ROV handled and insertion into specific anchored joints. 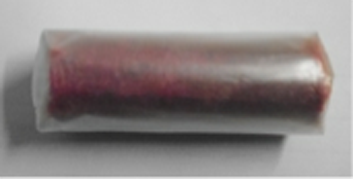 The Stick is contained in a PVA water soluble tube and film wrapped to control dissolution.